*Please note: all new members are manually approved on BetterEvaluation (to mitigate spam), so it may take a working day for new users to be able to access the GeneraTOR. We apologise for any inconvenience caused. 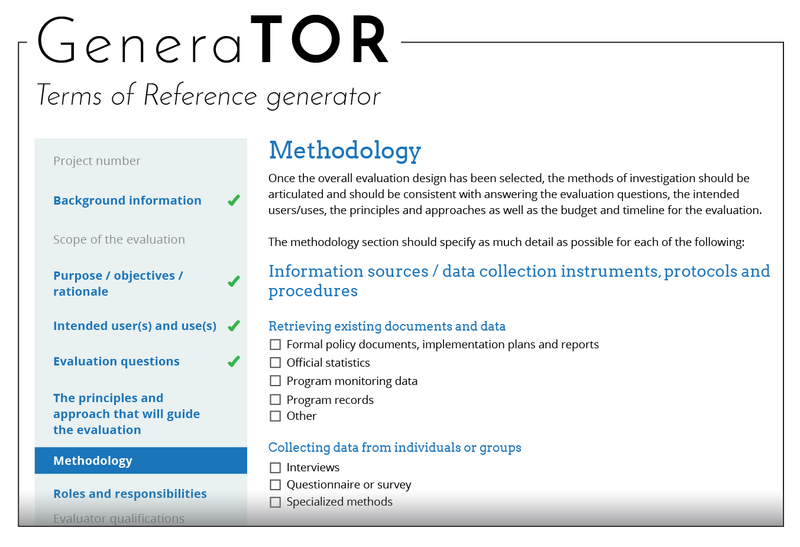 The GeneraTOR will guide you through writing the different sections of a ToR / RFP. It will generate a word document with your saved information which can then be further refined and/or reviewed by others. The bold and blue section titles in the left hand side navigation menu (shown above) are the required sections based on the ToR template for IDRC, however most sections - if not all - will also be relevant to other organisations. The exported Word document will include all the required sections plus the optional sections which you have chosen to include in your ToR. Each section heading in the document will contain "[To be completed]" until that section has been "Marked as complete" in the generaTOR. Let us know what you think of the GeneraTOR so we can improve it!